By the Rev. A. E. BRIGGS. St John the Baptist, East Markham, is a "splendid church" according to Pevsner and dates from the 15th century (A Nicholson, 1982). East or Great Markham, situated on the edge of the great forest of Sherwood, is the "ham" or "home" of the "Mark," the organised self-acting township. In Danish, Mark means a field or common. In this parish we have both Markham Moor and Markham Field, which are tautological expressions of the same idea—Markham, in fact, is the village or land outside the forest. It is situated on a ridge which forms the watershed of the rivers Trent and Idle. Its precise geological formation is that of the new red sandstone, and its soil is rich and strong, particularly suitable for plum and other fruit trees, whose produce forms one of the chief industries of the modern village. A few feet below the surface a considerable quantity of gypsum has been found. Going back to the earliest days of its history we find that during the two centuries before the Norman Conquest, Markham was peopled by the Danish immigrants, who settled in the valley of the Trent and mixed with the previous English settlers. The names of two of these in East Markham have been preserved—Ulchel and Godwin. When the length and breadth of the land was parcelled out among the followers of the Norman Conqueror, Markham was given to Roger de Busli, the list of whose lands in this county covers more than five pages of Doomesday Book. This Roger de Busli, or Bully, built Tickhill Castle, and in A.D. 1088 founded the monastery of Blyth. Under the "Land of the King" in Domesday it is recorded "In Markham three carucates of land and a half to be taxed. Land to ten ploughs. Twenty-five sokemen and fifteen villanes have here ten ploughs. There is a church and a priest, and forty acres of meadow, and a very little coppice wood." The tenants of Roger de Busli in East Markham were Turold and Fulc. Among his tenants in West Markham was Claron, who was the forefather of Alexander de Marcham, constable of Nottingham Castle during the reign of Henry II. (A.D. 1154-1189). His son, William, married Cecilia Lexington, and their son Richard was lord of West Markham and Tuxford. 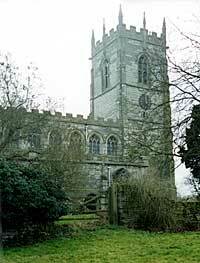 Richard's brother, Robert, died in A.D. 1289, his land in Markham going to his brother, but the Lexington estates were divided between his three daughters, who married into the great Nottinghamshire families of Sancta Cruce, Longvilliers, and Bekering. The nephew of Sir Robert, son of his brother Richard, was Sir John Markham, who arrived at the dignity of King's Serjeant. 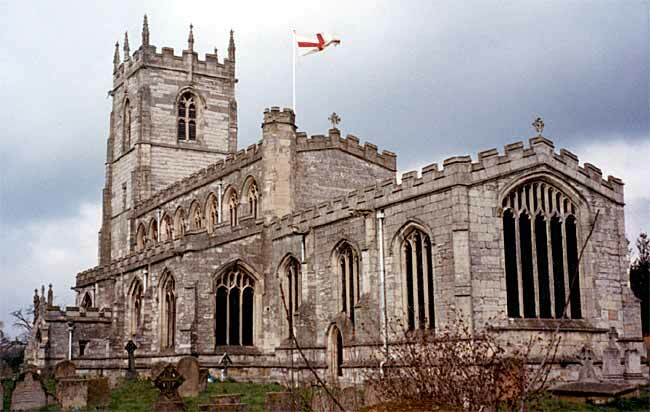 He was buried at East Retford in A.D. 1329. By his wife, Joan, daughter of the lord of the neighbouring village of Bothamsall, he had a son, Robert, also a King's Serjeant, who married Isabel, heiress of Sir John Caunton, of Caunton, in this county. Their son was Sir John Markham the judge, who became lord of East Markham. This Sir John Markham was made a King's Serjeant during the reign of Richard II. (A.D. 1377-1399). He drew up the legal document for deposing that monarch, and was appointed one of the com­missioners to receive the crown which Richard resigned in favour of his cousin Henry. Sir John had already become a judge in common pleas, which office he held from A.D. 1396-1408, the year before his death. There is a MS. History of the Markham family, written by Francis Markham in July, 1601, which contains the following passage: "In H. IV. time he was a judge of ye common pleas. When a servant of ye Prince of Wales was to be judged before him, ye Prince sending to have him released, ye Judge refused, ye Prince with an unruly route came and required it, ye Judge refused, ye Prince stroke ye Judge on ye face, ye Judge committed ye Prince to ye fleet. Ye King being told of it, thanked God he had so good a Judge, and so obedient a sonne to yield ye law." A similar tradition has been handed down in another branch of the same family, although some historians have given Gascoigne as the name of the judge. The judge's first wife was Elizabeth, daughter and co-heiress of Sir Roger de Cressey, of Hodsock. It was apparently through her that the judge became owner of East Markham. By this wife he had a son Robert, and a daughter Adela, who married Richard Stanhope, of Rampton, and thus became an ancestress of the Dukes of Newcastle, the present lay rectors of East Markham. His second wife was Milicent, daughter of Sir John de Bekeryng, and widow of Sir Nicholas Burdon, who was slain at the battle of Shrewsbury in 1408. Milicent, not content with two husbands, married as her third Sir William Meryng, She bore Judge Markham a son, John, the future Lord Chief Justice. St John the Baptist, East Markham (A Nicholson, 2003). I fear I have wearied some of you with these genealogical facts, but they help, us, perhaps, to understand some of the architectural facts which are before you this afternoon. Judge Markham, the husband of Milicent, and father of the Lord Chief Justice, is often spoken of as the founder of the church at East Markham, but it is evident that there was a church here in the time of the Conqueror, and the greater part of the endowment, with a mansion house, was given to the church here by the Dean and Chapter of Rouen. I am unable to give chapter and verse for this latter statement, but I have a note of this fact copied "from an old book" by the widow of my predecessor. There is a corroboration, however, of the former statement in the chancel arch, which is, of course, much older than the rest of the church; and remains of a much older wall could be seen in the west end of the south aisle during the restoration of the floor in 1897. Judge Markham could more properly be styled "Restorer of the present Church." I think that most probably Judge Markham rebuilt the aisles, nave, and greater part of the tower, and that his son, the Lord Chief Justice, leaving the chancel arch in position, pulled down the 13th century chancel and erected the present one in its place. I speak of the work having been done by individuals, because I am loth to upset the traditions which I found established when I came, but, knowing what we do of the zeal for the care and beautifying of their churches manifested by all classes in the 14th and 15th centuries, I should be inclined to substitute the "parishioners of East Markham" for the no doubt worthy and munificent Judge and Lord Chief Justice. The masonry of the tower, I think, may be found to bear me out, and I should be deeply grateful if any of the learned archaeologists present would explain the various dates there revealed.